Knee sprung is the result of disease that sometimes is brought about by bad shoeing. In a healthy leg the center of gravity is down through the center of the leg and out at the heels. This is changed in a case of knee sprung legs, giving the legs a bowed appearance. This trouble always comes on gradually; in some cases it will stop and never get worse, while in others it will keep on until it renders the horse useless. A horse with straight legs will sleep standing, but a knuckler cannot; he will fall as soon as he goes to sleep, on account of the center of gravity being thrown on a line forward of the suspensory ligaments. The cause of this trouble is sprain or injury to the back tendons of the legs; soreness of the feet, shins or joints. In old cases nothing can be done but just to relieve the strain a little by shoeing with a long shoe and high heel calks, with no toe calk. In cases not more than three months old clip the hair off the back tendons when there is any soreness, and shower them with cold water several times a day for a week or two, and then turn the horse out for a long run in the pasture. Contraction is in itself no original disease, except in a few cases. It is mostly the effect of some disease. Contraction follows sprains of the tendons, corns, founder and navicular disease. 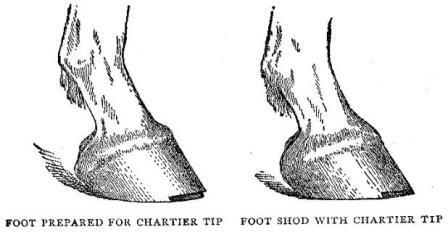 When contraction is the result of a long-standing disease of the foot or leg it will be in only one of the feet, because the horse will rest the affected leg and stand most of the time on the healthy leg; thus the healthy foot receives more pressure than the diseased, and is spread out more; the foot becomes much uneven-they don't look like mates. This kind of contraction is generally the result of some chronic disease, but in most cases contraction is the result of shoeing and artificial living. Before the colt is shod his hoofs are large and open-heeled, the quarters are spread out wide, and the foot on the under side is shaped like a saucer. The reason of the colt's foot being so large is that he has been running on the green and moist turf, without shoes, and the feet have in walking in mud and dampness gathered so much moisture that they are growing and spreading at every step. This is changed when the colt is shod and put on hard roads, or taken from the pasture and put on hard floors where the feet become hard and dried up. A strong high heeled foot is predisposed to contraction, white a low heeled flat foot is seldom afflicted with this trouble.